Craig is the Head of CoreData Research International. He relocated to London at the beginning of 2010 having spent the previous five years as head of market intelligence in the group’s Sydney head office. Prior to joining CoreData, he worked for several years as a financial journalist, writing for a host of titles and specialist financial services publications in Australia, Asia and the United Kingdom. His primary areas of expertise are retail banking, wealth management, investments, insurance and financial advice. With a strong background in financial journalism and consultancy, Angele is responsible for editorial quality and narrative development in CoreData Research’s UK projects. She also helps to ensure outcomes and insights are directly relevant to the client’s business needs. Before joining CoreData Research, Angele spent over three years as Deputy Editor at Funds Europe magazine. During this time she developed a reputation as a reliable, hard-working editor with an eye for an interesting story. She also worked as an institutional marketing executive at M&G Investments. This time gave her further insight into the world of fund management. Angele began her career as a news journalist with The Malta Independent – a daily, national newspaper. She made the transition into the world of finance, courtesy of Global Pensions magazine, following her relocation to the UK more than eight years ago. She has a BA (Hons) in English and holds the UK’s Investment Management Certificate. Chris joined CoreData Research in early 2013 as a Senior Consultant. Most recently Chris was Head of Investment News. Prior to that, he worked for Money Marketing. He has also worked for Incisive Media on its multi-manager publication from 2005 to 2007. In 2008, Chris won Headlinemoney Investment trade journalist of the year. Will joined CoreData Research in 2015 as a Senior Consultant. Will has a solid background in financial journalism and a proven track record in breaking exclusive stories across a range of leading trade titles. He started his financial journalism career at Newsquest before taking up roles at Euromoney, Incisive Media, and SNL Financial. Away from the world of finance, Will enjoys running, football, and travel. Paul joined CoreData Research in 2012 as a Research Consultant. Before this, he spent time at UCL studying for an MSc Public Policy where he focused on regulation and policy evaluation. He also read for an MSc in Economics at the University of Warwick, writing a dissertation investigating the impact of information communication technologies on GDP and labour productivity in Taiwan. His undergraduate degree was a BA (Hons) in Politics, Philosophy and Economics at the University of Manchester. 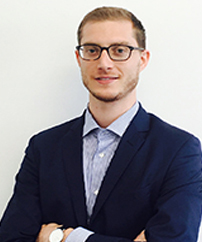 Daniel joined CoreData Research in 2014 as a Research Consultant. Before this, he spent time at UCL studying for an MA in Comparative Economics and Policy where he focused on econometrics, regulation and corporate finance. While completing his studies, Daniel worked as a business analyst for Introfund Consultancy in London where he produced research to help assist Chinese investors seeking entry in the UK market. Daniel has also worked oversees including tenures at EL Espectador in Columbia and the Economics and Trade Office at the Spanish Embassy in Turkey. He also has a degree in Economics & Politics from the Queen Mary University. Andrea joined CoreData Research in 2017 as a Research Consultant. He has a MA in International Political Economy from King’s College London where he focused on political and economic studies. He has an MSc in Economics from Bocconi University where he developed knowledge of macroeconomics and econometrics. He previously worked as a financial analyst at ENI S.p.A in Milan and as a business analyst at Accenture working in the financial services area of the company.